Part memoir, part essay collection, part spiritual journal, THIS GLADDENING LIGHT offers a unique perspective on the interconnectedness of universal themes--doubt and devotion, childhood and parenthood, disconnection and ecological mindfulness, anguish and empathy--all told at the level of the ground. This much-anticipated nonfiction debut from Christopher Martin is, ultimately, a work of belonging. Through narrative prose that moves between a rain-soaked Appalachian cove, Thoreau’s hut site at Walden Pond, hospital rooms in Atlanta and Cherokee County, Civil War battlefields crossed by highways, and the suburbanized, ore-red hills of Northwest Georgia, Martin paints a spirituality of the ordinary, of the creaturely world. Lyrical meditations abound with wasps enduring in derelict farm machinery, wildflowers dwelling on the rocks of Arabia Mountain, and two children--whether singing old R.E.M. songs, seeking insignificant butterflies in a roadside ditch, or simply abiding within the timbre of their mother’s heartbeat--all embody an “anonymous and unknown Christ who comes in merciful hiddenness to the distraught pilgrim,” as Thomas Merton wrote. This spirituality of the ordinary cannot ignore violence and injustice--the turmoil so often dismissed by manifestations of faith that lean toward prosperity, individualistic salvation, and the otherworldly--and Martin speaks to these themes, as well. The Gospel of Mary asks its readers to follow the “child of true humanity” that exists within. THIS GLADDENING LIGHT is no map to that inner child, as no map exists. But it is certainly one path along the pilgrimage. With the eye of a poet and the heart of a saint, my friend Christopher Martin explores a theology of love in this honest, gritty, and transcendent book. Martin’s quest, essentially, is for wisdom, and on this journey he brings his wise and beloved teachers--Thoreau, Merton, Jesus, nature--to inform the search. Oh god, if only we all were such seekers. Christian, father, husband, environmentalist, Southerner: those are all hard things to be in the twenty-first century. In these essays, we follow a young writer as he wrestles mightily with the implications and the complications of that identity. Our reward is Christopher Martin’s honesty, bravery, and winning prose. In a world that chooses to define religious doctrine and faith-based practices in black and white terms, Christopher Martin sheds light on the gray area of spirituality. This gray area is a place of mindful questioning, honest struggle, and joyful observation that is no less earnest and devout than any other means of seeking the divine. Martin speaks with an unfettered heart about family, nature, life, and death in a beautiful collection of essays that are both relatable and poignant. He is bold in articulating what so many of us think, but maybe are too afraid to say. In THIS GLADDENING LIGHT, Martin explores what it is to be human alongside the great unknown that religion presents us. His words offer comfort to the restless, acceptance to the misunderstood, and a majestic view of the natural world--that ever expansive wilderness of small wonders that is God’s creation. Christopher Martin’s poetry and essays connect with both the big and small concerns of life. With wry humor and lyricism, he travels in the tradition of H. D. Thoreau, Thomas Merton, Wendell Berry, and Mary Oliver, where a contemplation of nature is also a recognition of the Holy in all things. Nowhere is this recognition stronger than in children. 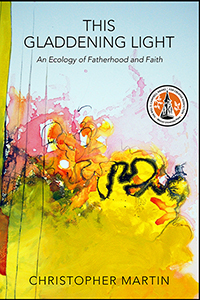 THIS GLADDENING LIGHT is an exploration of what it means to be a father in the context of faith, contemporary events, and nature. It is extraordinary that this insightful work comes from a young writer, whose reflections on religion, nature, literature, and family create a synthesis of ideas and imagery that is as pleasurable to read as it is effecting.